We are having a typical Colorado fall. Yesterday my kids were wearing shorts and T shirts; by the end of the week they will need boots and coats. And of course they will be able to wear shorts again next week I am sure. It is so funny because no matter what temperature it is outside in the fall you see a wide variety of clothing. There are people who can’t wait to get out their fall wardrobe as soon as they can and there are those who can’t let go of their summer wardrobe. You can stand in line with some one in shorts and tank top and another person wearing boots, a sweater and a scarf. Colorado weather can be a little funny that way. So I may not yet now what season I am in by the clothing, but I do know it is fall because of all the apples. The variety of apples is amazing to me. There are so many; and one day I think it would be so fun to have tried them all. But I swear it seems that every year I notice a new variety that I have never seen before. So, either I am not paying attention or someone is creating new apple varieties just to test my sanity. 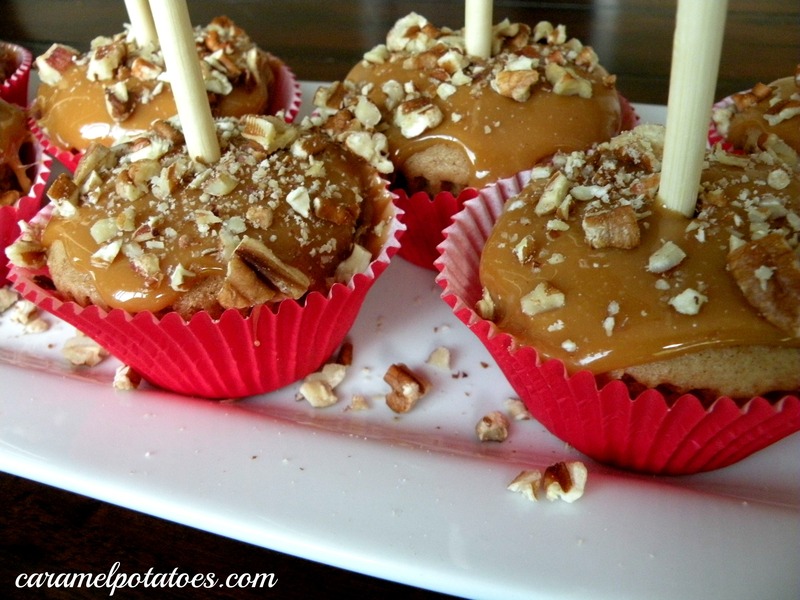 Luckily for us these delicious Caramel Apple Cupcakes need your basic Granny Smith variety. We are simply going to doctor up a box cake mix and Voila you have a delicious and impressive cupcake. Preheat oven to 350 degrees. In a stand mixer, combine cake mix, eggs, sour cream, milk, and vegetable oil until incorporated (about 30 seconds). Scrape sides of bowl and then beat on med-high speed for 3 minutes. Stir in apple. 2. Spoon batter into paper-lined muffin pans, filling two-thirds full. Bake 18-20 minutes or until a wooden toothpick inserted in center comes out clean. Do not overbake. Remove to a wire rack to cool. 3. While cupcakes are cooling, combine caramels and cream in a medium saucepan over very low heat; stir 4 minutes or until smooth. It’s very important to keep the heat very low because if the caramel gets too hot it will become really hard when cooled. 4. Spread caramel mixture over cupcakes being careful to not touch the caramel to the paper liners or it will stick to the liners; immediately sprinkle with pecans, pressing in slightly. Insert a wooden stick into center of each cupcake. Store covered in an airtight container. 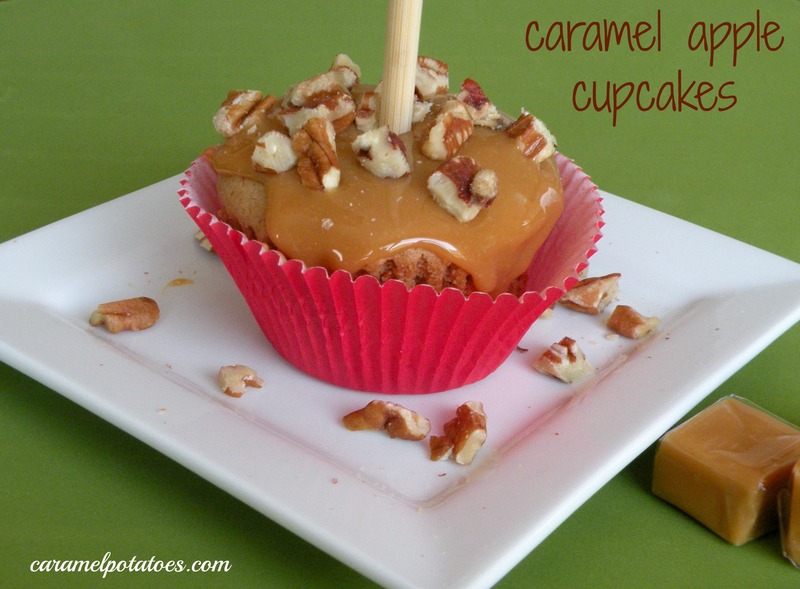 It’s best to serve the cupcakes the same day that you add the caramel topping. Caramel will soften if kept at room temperature for too long so store in the refrigerator until ready to serve then let come to room temperature to let caramel soften up a bit.